The Friendly place to meet people & A home away from home. No age limit & Open 24 hrs. In accordance with Thailand's law, we are officially licensed to arrange travel by Tourist Authority of Thailand. Travel license No. 23 / 0287. Please make sure you join a reliable organization for your safety and comfort. Set between the lovely Mae Ping river and the sacred Doi Suthep mountain lies the Chiang Mai International Youth Hostel in a quiet neighborhood along the busy Chang Klan Road (famed for its night bazaar). 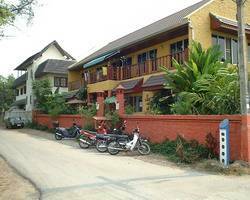 Chiang Mai International Youth Hostel is the original member of the Thai Youth Hostels Association & International Youth Hostel Federation (IYHF) in Chiang Mai. Many changes have taken place as we grow with the development of the city. Many of our valued guests who stayed with us as backpacking students have kept returning to stay with us. Their comments and feedback have been invaluable to us in setting a new era in Thai hostelling at the Chiang Mai International Youth Hostel today. At the new Chiang Mai International Youth Hostel (opening 01 Dec, 2005), we understand the demands of the new generation travelers who seek for clean, comfortable and safe environment without compromising on expensive room rates. With a country warm design in a garden atmosphere, you will find that our room rates are not only of great value but most important of all, you continue to enjoy our warm northern Thai hospitality the moment you step in that can make your stay a most rewarding one. All our rooms come with modern en-suite facilities and are fully airconditioned. Our beds are purpose-built with an Asian design with private hot/cold showers and western style toilet, satellite & cable TV (local Thai channels, English movies, CNN, BBC, MTV, NHK, French, German, Italian, Chinese and National Geographic) and Internet connection. Children below 6 years old may stay free when sharing with adults using existing beddings. Maximum room capacity is 2 adults + 2 children below 6 years (or 1 child below 12 yrs). Extended check out time is 1200hrs (check in time is 7am). Courtesy pick up transfer is available. We also run a full-fledged travel desk with attractively priced tour and trek packages. 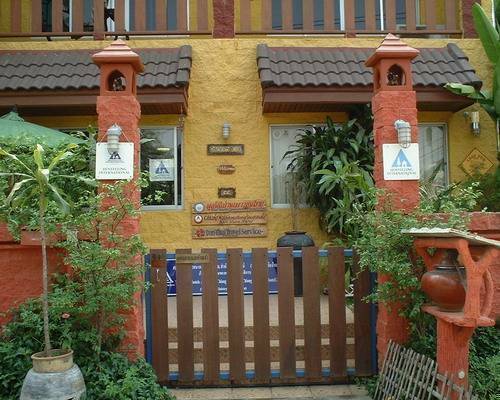 At Chiang Mai International Youth Hostel, we are your one stop travel center.
" FREE Hi-Speed Internet in the lobby and restaurant is available for all guests"
When you arrived by bus or by train, you can use TUKTUK or Taxi, the cost will be around 30 - 50 baht for 1 - 3 persons / one Tuk Tuk , if you use red mini bus, the cost will be 30 - 40 baht per person. When you arrived by plane, you can take the taxi from the airport, the cost will be 80 baht for one taxi. Please be careful , they try to bring somewhere or try to cheat & deceive etc. Anyhow the best way to do please give us a call for free transfer. BUT ! Not too early pleaseour working time: 08. 00 a. m. - 07. 00 p. m.
Please do not trust anyone who tells you. They are from Chiang Mai International Youth Hostel or tells you to book their trek from Bangkok or any kind of tour, accommodation etc.. they may even give you the wrong information such as the hostel is very far from the town, the hostel has been closed, fully booked or tells you sign up on their trek now because maybe you can not get your place there. Most of them are around the main train station (Hua-lam-pong), Northern bus station, Don-Muang airport etc.. Many of them now claim to be the officer from TAT. Please do not trust them ! They try to CHEAT & DECEIVE you. They will charge you too much, not take any responsibility when you have problem etc.. You can book your trek or any kind of tour with our Travel Section at the hostel directly. Low cost adventure for all age when you travel & stay with us, we are sure you will get a better price than when you book in Bangkok. Out 3 days 2 nights trek, 2 days 1 night trek & One day trek or any kind of tour depart daily. Please do not worry about your place. We have highly recommended in all the guide books around the world. We have very good name. The cliche A home away from home. Really applies here. Try it and you will soon agree. A percentage of proceeds from selected tours or treks booked with our travel section will be donated to the Thai Youth Community Foundation to help education and improve the lives of the less privileged Thai children. 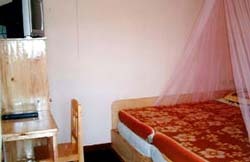 Ensuite Single/ double or twin room with air-con, International Cable T. V. and private hot shower. Free WiFi high speed internet, WiFi in room. Doi Suthep Temple 4 km. Mae Ping River 200 m.
Cancellation must be notified to the hostel directly at least 48hrs. prior to arrival. In the event of a no show, your card will be charged for the first nights accommodation total. 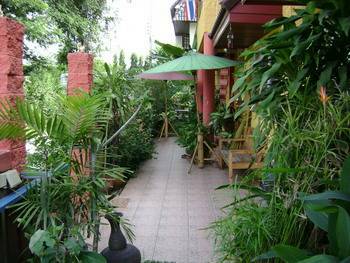 On Chang Klan rd - Next door from Park hotel , walk down and see our Hostel logo then turn right 150 m. 2nd small lane , then turn right " Yelllow building is Chiang Mai International Youth Hostel. 15 mins by Tuk Tuk from bus station or train station , cost around 50 Bht. 15 mins by taxi from airport.